A handy cheat sheet for voters considering the huge Move Seattle transportation levy. Covering the tech industry in my previous job wasn’t too hard once I figured out the jargon. Now that I write about additional topics ­­­— including government and politics — I’m having to learn new buzzwords. What transportation buzzword annoys or mystifies you the most? Join the conversation on Facebook. Deciphering these puzzles are fun. The word games are so clever in Seattle, voters might not realize what they’re approving until long after elections. It reminds me of buying a phone. Grand bargains promise “free” phones and “unlimited” data. But people still end up paying around $2,000 over a two-year contract, during which data is throttled if they use too much. Getting to the bottom of those contracts is a breeze compared to sorting out what Seattle officials mean when they talk about issues like affordable housing or transportation. This is important as Seattle asks voters this fall to approve Move Seattle, raising $930 million for transportation-related projects. Over this nine-year levy “contract,” the average homeowner would pay around $2,500. Renters and businesses would also pay, through higher taxes on property they occupy. They might all end up throttled on city streets. Here’s a cheat sheet to help understand some of the terms. COMPLETE STREETS: No, this doesn’t mean finishing projects. It refers to streets being rebuilt to encourage biking, walking and transit. Since 2006, Seattle has required new road projects to be evaluated for “complete street” treatment. ROAD DIETS: Similar to complete streets. Seattle plans to eliminate car lanes on dozens of arterials to make way for bike paths. These are controversial, so Move Seattle supporters instead talk about improving safety, partly by adding protected bike lanes. TRANSPORTATION CHOICES: When Seattle officials talk about creating transportation choices, they mean adding bike paths, bus lanes and other nondriving options. That would be great if it was done in a way that didn’t also reduce capacity for cars, which will remain the most popular transportation mode. Instead, choices for the majority are diminished. It’s like offering the choice of chicken or tofu, then taking chicken off the plate and adding more tofu, even though most people by far want chicken. CONCURRENCY: This is a hot topic in many Puget Sound cities struggling with traffic, but it’s not mentioned in Move Seattle proposals. Under the state growth management law, road improvements are supposed to be done concurrently with growth. If growth overloads roads, cities must have a plan to remedy the situation within six years. Seattle’s transportation department claims not to do any quarterly or annual reports on its streets’ level of service, the measure that triggers concurrency rules. The most recent annual report on its website is from 2010. Traffic-service counts used by Seattle’s planning department are odd. Eastbound Denny Way, for instance, clogs at rush hour to Interstate 5. But the city’s count says only about 75 percent of its capacity is used at rush hour. That may be because the count is taken on the far side of South Lake Union at Minor Avenue. A consultant recently updated a computer program used to model Seattle street capacity. The model was tweaked in a way that shows a 20 percent increase in capacity on most arterials, according to a memo included in the city’s new, draft growth plan. The model says the only major street now close to maxed out at rush hour is the Ballard Bridge. 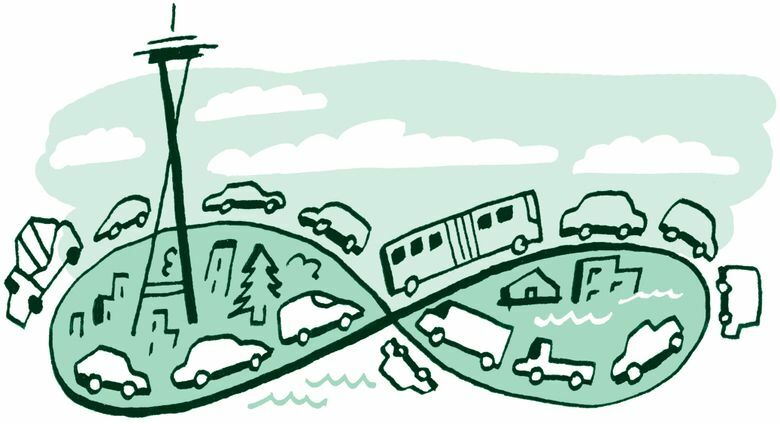 CONGESTION RELIEF: More than 80 percent of trips in the Puget Sound region and 43 percent in Seattle are made with single-occupant vehicles. Even in multimodal South Lake Union, only 25 percent commute via transit. But the largest share of “congestion relief” money would convert arterials to “multimodal corridors” with bike paths and transit lanes. The pitch is that this creates choices, so people will drive less and relieve congestion. OUTCOMES: If you spend $930 million on transportation, you expect to get around faster. But Seattle planners believe it will take longer to get around in 2035. The mix of car and bike use won’t change much and traffic will get worse, according to the city’s growth plan. Single-occupant vehicle usage will decline by just 3 to 4 percent over the next 20 years. Light rail — which is happening regardless of Move Seattle — is a big factor. Average vehicle trips will take up to 11 minutes longer. Driving will be especially bad between downtown and West Seattle, Duwamish and Southeast Seattle — trips that will take 40 to 70 percent longer. Although Move Seattle would squeeze more than 100 miles of new bike routes onto Seattle streets, that will have a negligible effect on how Seattleites move. Over the next 20 years “bike trips are expected to increase about one percentage point due to a more complete bike lane and cycle track network,’’ the city’s growth plan says. Voting on this levy is a rare opportunity for Seattle residents to make an actual choice about these things. Choose carefully.